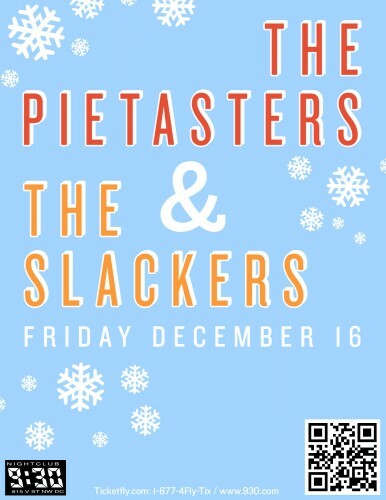 This week we are giving away a pair of tickets to see The Pie Tasters & The Slackers at the 9:30 Club on December 16th. Tickets for this concert are available on Ticketfly or at the 9:30 Club box office. For your chance to win these tickets simply leave a comment on this post using a valid email address between 9am and 5pm today. One entry per email address, please. Comments will be closed at 5pm and a winner will be randomly selected. The winner will be notified by email. The winner must respond to our email within two hours or they will forfeit their tickets and we will pick another winner. Tickets will be available to the winner at the 9:30 Club Guest List window one hour before doors open on the night of the concert. The tickets must be claimed with a valid ID. The winner must be old enough to attend the specific concert or must have a parent’s permission to enter if they are under 18 years old. If today doesn’t turn out to be your lucky day, check back here each Wednesday for a chance to win tickets to other great concerts. I’ve been looking forward to this show for a while! Would love to see these two bands together! I saw the Pietasters a long time ago in Florida. Pick me! Mmmm. Tasting pie and slacking — these are just two of my favorite things. Such a great line up! Love those guys! I’ve been doing research on ska all semester. I would SO love to go to this! I’d love to go on Friday — no plans yet! I love DC! I love Pie! I love Slacking? Love both these bands, total ska legends! I would love to be able to go! My husband will marry me all over again if I can win him these tickets! PLEASE PICK US! I saw them in New York last year…def. want to see them again! Oh man, I really want those tickets!